In terms of looks, the G310R is exactly what you would expect a BMW designed bike to look like. 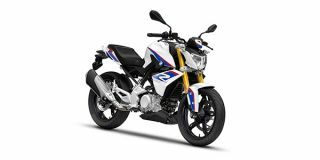 BMW says that the bike follows the same design language that we have already seen on the new S1000R. The V-shaped headlight with the golden finished upside down forks gives the front an aggressive stance. The profile is dominated by the large sculpted 11 -litre fuel tank, the tank extensions and the massive exhaust. The seat looks long and wide enough for comfort. Seat height at 785mm is low.